As spring takes hold, you can find ducks busy wherever there is water. 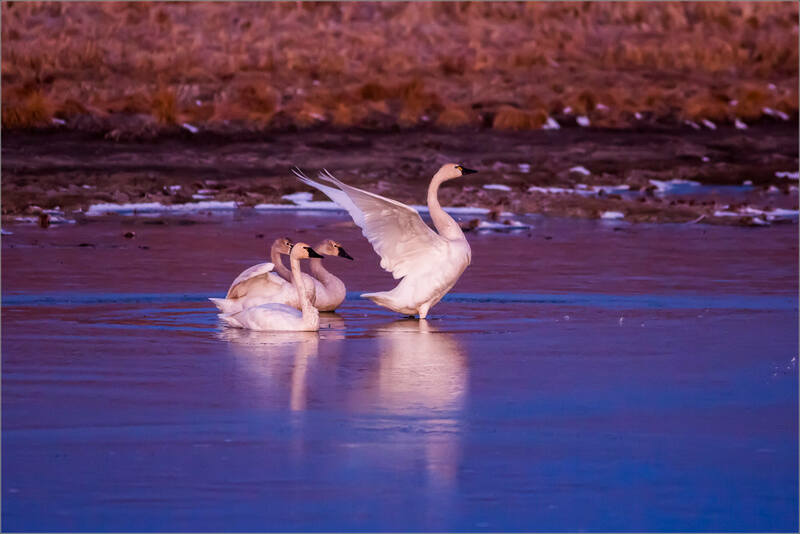 Whether it is at a lake still mostly covered with ice or a pond that is not much more than a puddle in a field, a male and female pair are often there paddling, wading, fishing or cleaning. I found this couple in a shallow depression where snow melt had collected. The light was warm gold and I thought they looked absolutely beautiful. As I slowed down, I flushed them into the air. I was disappointed in myself as I’d prefer to wait until they chose to fly on their own accord. Still, it was a transitory location for them and one that was close to the roadside so I didn’t carry too much concern away with me after watching them launch and head away. 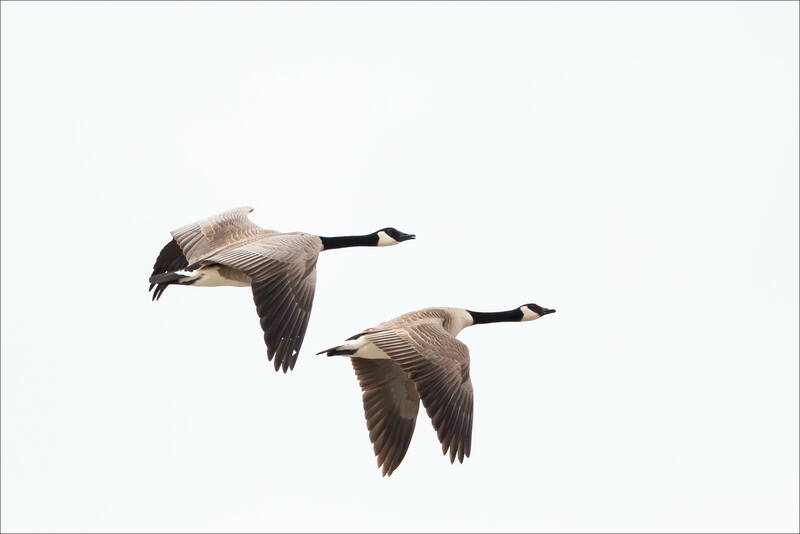 This pair of Canada geese flew over our deck in Redwood Meadows. 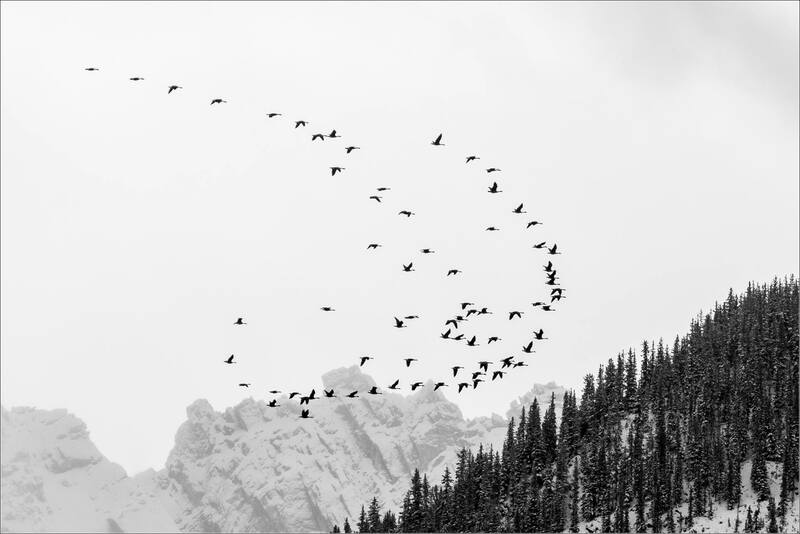 These birds are migrating all across North America now and we are certainly getting our share. With the overcast sky, the even light showcased the beautiful textures and tones in the wings. 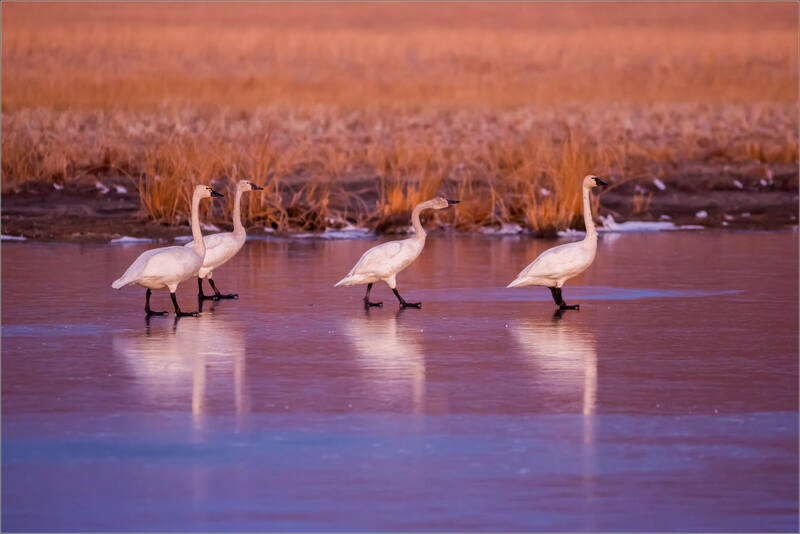 A week ago, shortly before sunrise I found this small flock of Tundra swans in a pond near the Bar U Ranch along Highway 22. The birds had just started moving around breaking the ice that had formed on the water. 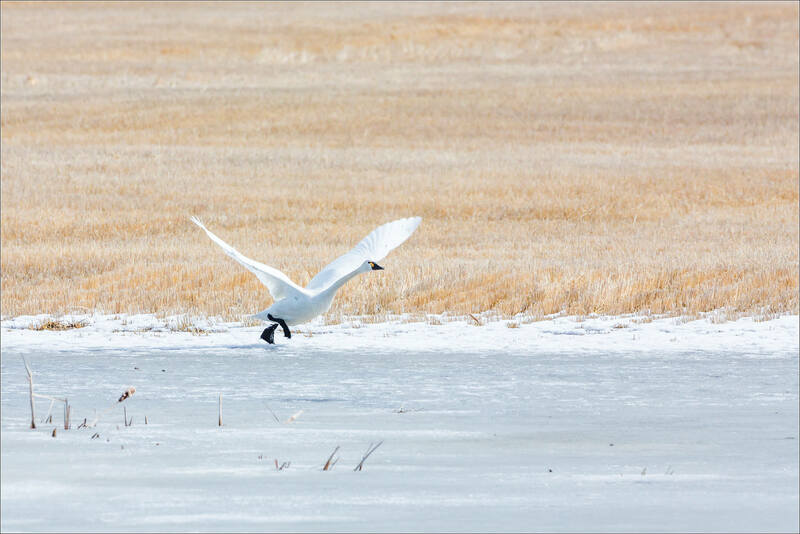 It was cold and quiet – I enjoyed watching the swans sort themselves out, shake off chill and step up onto the ice. There are large gatherings of swans on the prairie around Frank Lake right now. This area is on the migration path and I really enjoy getting to see these birds when they pass through. 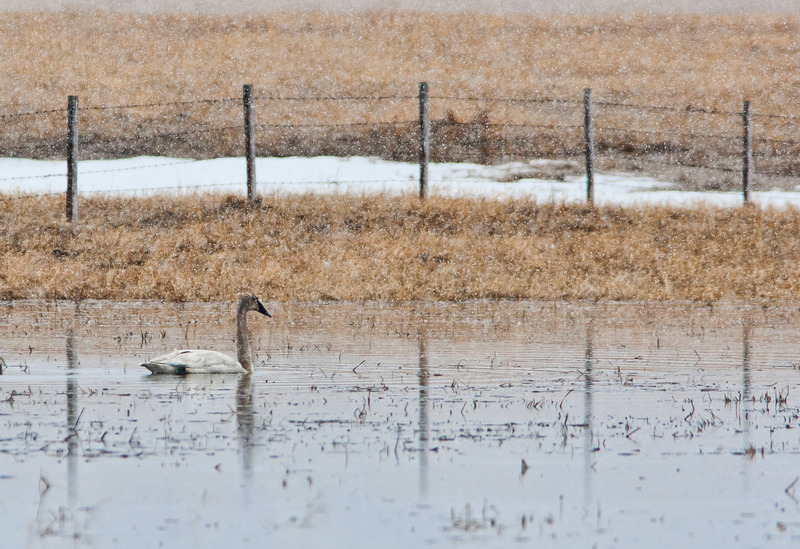 This Tundra Swan (Cygnus columbianus) was sharing a small flat of ice apart from a small group. I watched them, and they watched me for a few minutes. Then they took their running launch to get into the sky. Heading into a steady headwind, they seemed to gain altitude very quickly once they were airborne. There was a storm that burst out of the mountains and settled over the prairies around Calgary in the middle of the week. 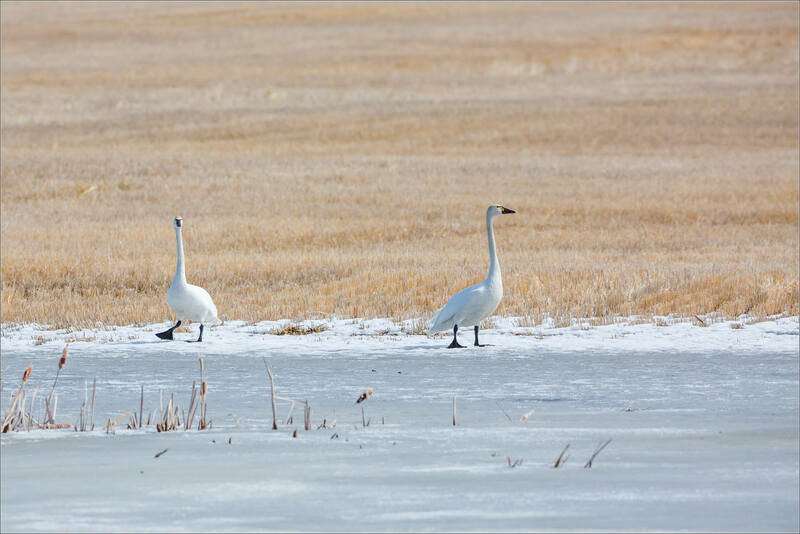 With the warmer weather that preceded the blizzard, there are hundreds of shallow depressions currently masquerading as ponds in the fields and meadows. 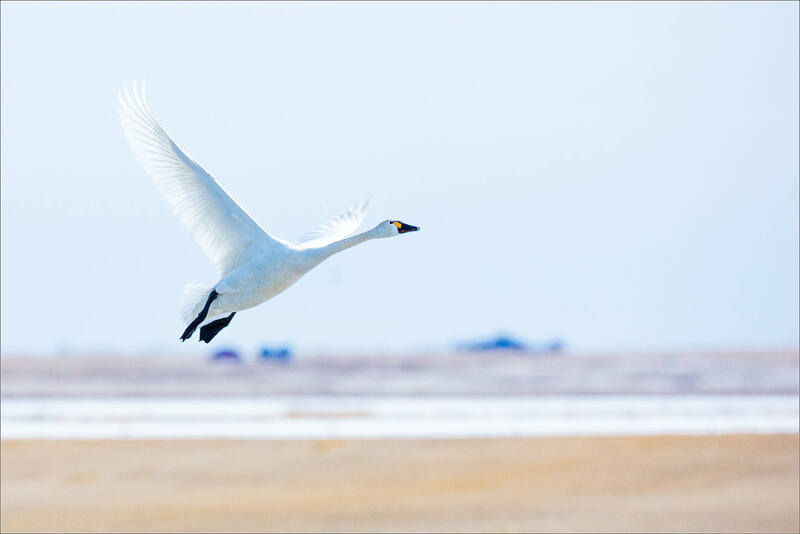 It serves the waterfowl that are currently migrating to their breeding grounds in the north. I found this resolute swan paddling in one of these pools in Springbank. Together with a partner, it was dunking its head looking for food and seemingly oblivious to the angry snow falling. 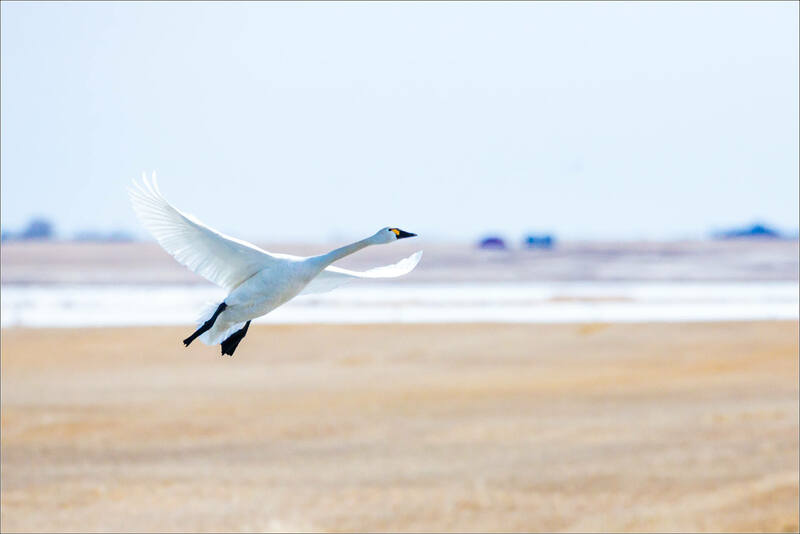 The Tundra and Trumpeter Swans briefly stop in this part of Alberta, the largest regattas only staying for one or two days. By the end of this weekend, most will have flown on. 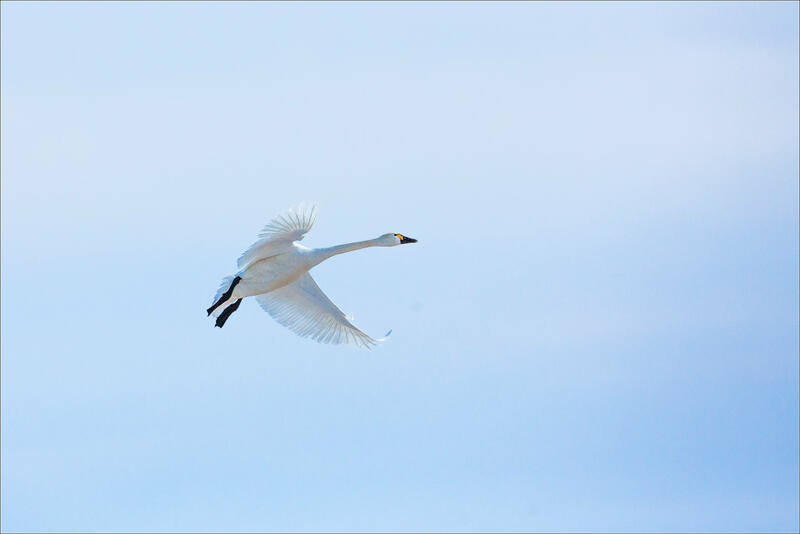 I did not get too close to these birds so I have to guess that this is a Trumpeter as I could not see a yellow spot on the bill which is only found on the Tundra Swan. However, with the mottled grey plumage, I think it is an adolescent and I’m not certain whether the yellow spot only develops in adults. Either way, great to see these short-term visitors.